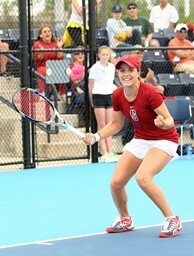 Nicole Gibbs is one of only five players to win back-to-back NCAA Division I women’s singles championships. Stanford junior Nicole Gibbs (Cincinnati) helped lead her team to a title run at the NCAA Division I Championship which took place the week of May 20 at the University of Illinois in Urbana, Ill. Gibbs won her second consecutive NCAA singles title defeating Nebraska senior Mary Weatherholt (Prairie Village, Kan.) 6-2, 6-4, to become only the fifth player in history – and the fourth from Stanford – to win back-to-back NCAA Division I women’s singles championships. Gibbs’ win helped No. 12 Stanford claim a suspenseful 4-3 win over No. 3 Texas A&M to win its 17th NCAA women’s team title. The win helped the Cardinal women’s tennis team keep alive Stanford athletics’ streak of winning at least one NCAA team championship for 36 consecutive years. An American has now won six of the last seven NCAA Division I women’s singles championships. Traditionally, when an American wins the NCAA Division I men’s or women’s singles title, the USTA strongly considers that player to receive a wild card entry into the summer’s US Open main draw. Gibbs, 20, currently ranked a career-high No. 177 in the WTA rankings, received a wild card into the US Open main draw last year after beating then teammate Mallory Burdette to win the title as a sophomore. Tennis Channel will air highlights of the NCAA Division I team championships on the NCAA Championships Highlight Show presented by the USTA, premiering on June 8 at 2:30 p.m. ET. The show, hosted by Scott Treibly, is scheduled to air an additional four times: June 8 at 8 p.m. ET; June 13 at 12:30 p.m. ET; June 14 at 4 p.m. ET; and June 27 at 11 a.m. ET.